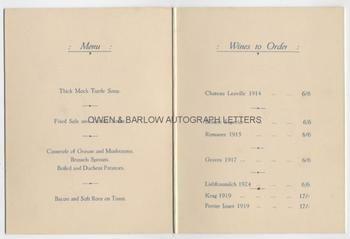 HERBERT "BERT" HINKLER Autograph Signature on Menu Card. Herbert John Louis Hinkler (known as Bert Hinkler). Australian pioneer aviator. Made the first solo flight from England to Australia. 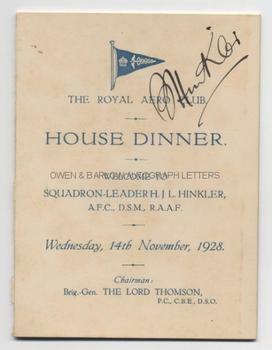 A good, bold autograph signature on menu card for the Royal Aero Club House Dinner to welcome Squadron-Leader H.J.L. Hinkler A.F.C., D.S.M., RAAF. Wednesday, 14th November, 1928. The folded menu measures approx. 6 x 4.5 inches (folded), 6 x 9 inches (unfolded). Printed on heavy ivory card with menu and wine list printed in blue. In fine condition. Bert Hinkler was possibly Australia's foremost pioneer aviator. He served with distinction in the RNAS and RAF during World War 1 and was the pilot for Britain's Schneider Trophy sea-plane. In addition to setting several remarkable air endurance records, he was also a fine aero-engineer and the inventor of several aviation instruments. In 1928 he made the first solo flight from England to Australia, setting a record for the flight of 15 days. He became the subject of popular acclaim and was dubbed 'Hustling' Hinkler and 'the Australian Lone Eagle'. 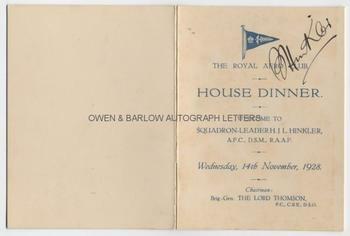 After the flight he returned to England, where he received the Air Force Cross and the Royal Aero Club gave a banquet in his honour (for which this is the menu card). Hinkler was also the first person to fly solo across the Southern Atlantic Ocean. After Hinkler's England-Australia record was broken, Hinkler set out on another record breaking flight in 1932 but his plane crashed over Italy and he was killed, still aged only 40. Consequently, his autograph is relatively uncommon.